SSC JE 2016 Last date to apply online extended.! SSC JE 2016- Staff Selection Commission (SSC) will conduct an open competitive examination, on 3 December 2016 to 05 December 2016 in online mode for recruitment to the post of Junior Engineers (Civil, Electrical & Mechanical), Group ‘B’ Non-Gazetted. The Official Notification of the SSC Junior Engineer Exam 2016 has been issued on 30 September 2016. Aspirants need to check the complete eligibility criteria before submitting the online application form. Online Registration process was started from 30 September 2016 and will conclude on 3 November 2016. The eligible and selected candidates will be recruited in the Pay Band of Rs.9300-34800/- plus Grade Pay Rs.4200/-. 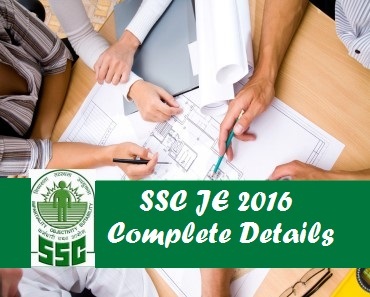 Read the below-listed details on SSC Junior Engineer 2016 Exam. Electrical), Department of Posts 03 years Diploma or equivalent in Civil Engineering or Electrical Engineering from an institution recognized by the Central Government or State Government. Defence. (a) JE (Civil)- Three years Diploma in Civil Engineering or equivalent from a recognised University or Institute. 02 years of working experience in the field of civil construction in monitoring and executive of projects. (b) JE (Electrical & Mechanical)- Three years Diploma in Engineering (Electrical or Mechanical) from a recognized University or Institute. Two years working experience in the field of Electrical or Mechanical Engineering in the area of construction in monitoring and executive of projects. Admit Card of SSC Junior Engineer 2016 Exam will be issued in the month of November 2016 by all the regional SSCs (Staff Selection Commission). Candidates will need their application number to download the same. Admit Card is a very important document that every applicant will need in order to appear in the examination. It will also be sent to the postal address of the candidates, however, if you fail to download the same, then you can visit the respective regional website to download the duplicate SSC JE 2016 Admit card. Candidates need to qualify the written examination and the personal interview with a minimum cut off marks in order to get selected for the mentioned post. Aspirants have to attain the sectional cut off as well. Only qualified candidates will receive their appointment letter. Keep Visiting CareerLive360 for latest updates on the SSC JE 2016 Examination…!!! I am just trying to find out some good websites for studying. I was searching over bing and google and found your blog. Nicely i love your professional website design and style along with your authoring capabilities. Keep doing it.